Originally from tropical South America, this scrambler is readily distinguished by the glossy green leaves arranged in whorls of 3-4 and the presence of white latex. 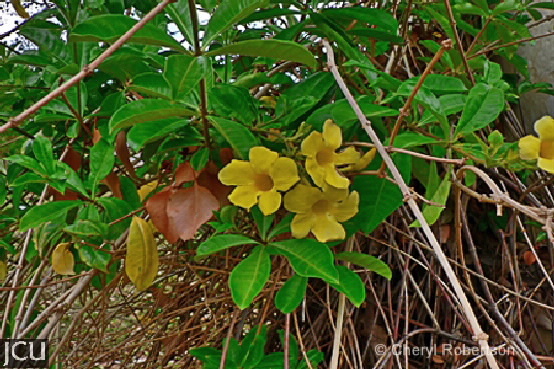 The funnel-shaped flowers, that occur in clusters, are yellow with 5 overlapping petals. Fruit rarely found. Persistent root base. Several cultivars available. Several pink flowering species growing in the district. Flowering most of the year.